In terms of size, Smiths' discography hits the sweet spot - large enough to have heft, but small enough to be wholly accessible to even mid-level fans. Their style evolved, but the development is so consistent and organic that their entire body of work coheres as a fully integrated collection. Among the various subcategories in the catalog, Smiths had a regular fondness for the plaintive ballad. On songs like 'Asleep', 'I know it's over', 'Last night I dreamt that somebody loved me', 'Reel around the fountain', Morrissey kept the lyrics to a minimum (even if the titles were long) and the sentiments plain, and Marr coaxed unusual pathos out of the most straightforward chords. 'Well I wonder' is possibly the most achingly beautiful of all of these, and it stands among the greatest of all the great Smiths songs. (There are so many; it's easier to count the flubs, if you can find them.) It is a song of obsession that keeps its pride, of desperation that maintains its dignity, of adoration that accepts its futility. It was released in the same year as The Breakfast Club, which featured Simple Minds' bombastic telling of the same story. 'Don't you (forget about me)' is the anthem that takes the same pretense as 'Well I wonder', and adds four times the words and a truckload of idealism. The outsider is granted access; the invisible one becomes visible; we're all the same underneath. It's the perfect ending to a film that romanticizes teen angst and teen catharsis, even as it strives to depict those things with new candor. But in the land of Meat Is Murder, no one has spent the day breaking down stereotypes in the library. No one has found the pretty girl inside the basket case and paired her up with the star athlete for a kiss. And no one la, la-la-la-la's their way across the football field, confident that they won't be forgotten, that their name will be called. 'Well I wonder' tells the story the way it actually happens, where happy endings are never truly entertained, much less achieved. 'Do you hear me when you sleep? / I hoarsely cry.' Even as I ask, I know: of course you don't. 'Do you see me when we pass? / I half die.' Of course not; I really am invisible. Here is the plain emotional truth; this is candor. No one gasps, barely alive in tragic romances - no one's final stand registers in anything less than epic terms. In this song, our anti-hero's final stand is quite small, insignificant even, worthy only of a distracted drum line and a no-frills guitar part, marking time until it's over. The music, particularly the quiet slide guitar, seems to patiently wait for Morrissey, who lingers, not as much to be noticed as to savor the heartbreak. He shifts into falsetto to repeat 'Please keep me in mind', transforming the phrase into onomatopoeia. 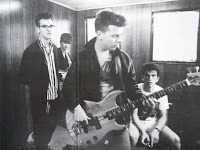 The showers that wash the song away flirt with heavyhandedness, but somehow Smiths get away with it. Lovelorn alternative kids everywhere, take comfort in knowing that there is someone out there who actually hurts more than you do.